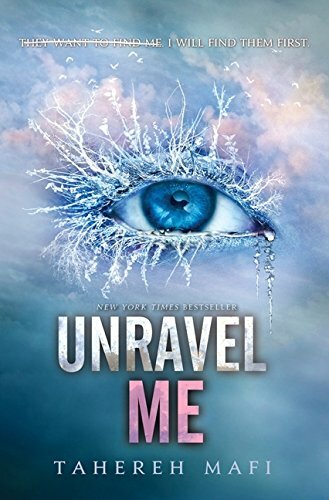 Unravel Me is Tahereh Mafi’s second book in a dystopian YA trilogy. The story picks up directly where the debut, Shatter Me, left off. Juliette has escaped from The Reestablishment and thwarted their efforts to use her unique abilities as a weapon. Taking refuge at Omega Point, the headquarters of the rebel resistance, offers Juliette hope and the chance at a new life. It also gives her an opportunity to explore romance with her fellow escapee, Adam. But if she thinks The Reestablishment is going to give up on her that easily, she’s mistaken, to say nothing of Warner, son of The Reestablishment leader. He has acute, raw feelings of his own in regard to Juliette. He’s not above letting her know how he feels. Things are heating up in more ways than one. Tahereh. Mafi certainly didn’t suffer a “sophomore” slowdown in this second novel. She does an excellent job of fleshing out her characters as the saga continues. There’s also a good dose of the psychological. The author peels back the layers of characters’ psyches, letting the audience in on what haunts them, what drives them. Interspersed between the first novel and the second, Ms. Mafi released a short ebook, Destroy Me. It’s written from Warner’s perspective, and gives a surprising look into the feelings of a boy who appears hell-bent on destruction. The eBook also whets your appetite for what you know will be an explosive meeting between him and our heroine, Juliette, in Unravel Me. In the midst of learning more about the inner lives of the characters, the action and the forward momentum of the story are not neglected. The action and emotional components, indeed the romance, are all seamlessly blended. The author uses the device of repeating words or phrases, sometimes in triplicate, when Juliette is in a particularly emotional or stressful state of mind. It can work, but it can also become redundant—and skippable. Unravel Me is a novel that works. The story and character arcs are glorious and well thought out. The conclusion will leave you hungry for that third book. You have to learn how Juliette comes into her own and resolves her relationships with Adam and Warner. The connections between all three are rich and complex. Tahereh Mafi has proved herself a masterful plotter and storyteller.